Closing out the summer as one of the top dogs in the Cape Cod Baseball League is not easy. But this Georgia Bulldog has relentlessly chewed his way into an elite group of closing pitchers. Like a bulldog protecting his rawhide bone, right-handed relief pitcher Joshua Fields knew how to eye his competition at the plate, winning the league’s Russ Ford Award for top relief pitcher. Fields led the Cape League in saves with 13 for the league champion Y-D Red Sox this summer. Working 17 2/3 innings this season, Fields allowed only five walks and managed to strike out 27 hitters. Fields’ star qualities landed him a spot on the roster for the CCBL All-Star Game, and he had the opportunity to enjoy an evening at one of the most historic ballparks in history, Fenway Park, for the All-Star Recognition night. Closers should have a dominating fastball and nerves of steel. Fields had both, regularly pushing his heater towards 100 miles per hour while saving nearly half of Y-D’s 28 regular season wins, the highest total in the regular season for any Cape League team. 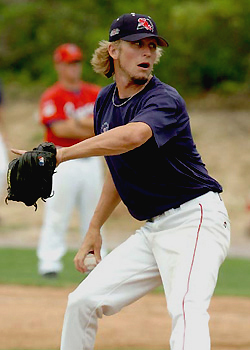 He closed out the summer on the Cape as both an All-Star and a CCBL champion.